The candidates selected for the post of Junior Statistical Officer (JSO) under Ministry of Statistics and Programme Implementation (MOSPI) i.e. 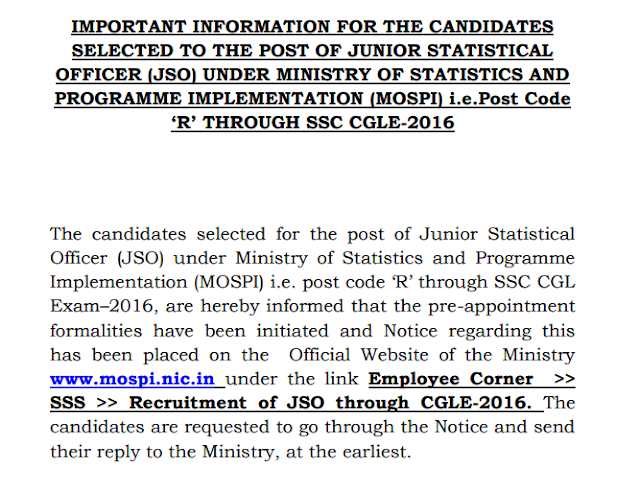 post code ‘R’ through SSC CGL Exam–2016, are hereby informed that the pre-appointment formalities have been initiated and Notice regarding this has been placed on the Official Website of the Ministry www.mospi.nic.in under the link Employee Corner >>SSS >> Recruitment of JSO through CGLE-2016. The candidates are requested to go through the Notice and send their reply to the Ministry, at the earliest.